Michael Okorocha – House On The Rock, The Refuge, Abuja. ANNOUNCEMENT FOR BABY DEDICATION SERVICE, SUNDAY 19TH NOVEMBER 2017. Parishioners with GTB accounts can now make payments for Tithes & Offerings by dialing the strings below on their phones. It is free and you don’t need to use data for this. *737*32*AMOUNT*574 (Offering) *737*32*AMOUNT*575 (Tithes) Regular Pastoral Care Centre (PCC)meeting continues this week at the various PCC venues across the city. ALL MEMBERS are encouraged to attend and those who are yet to identify with a PCC family should do so. Our End of Year PUSHbegins tomorrow Monday 20th November to end on Thursday, 23rd November 2017. There will be corporate prayers on Monday & Wednesday by 5:30pm at the Citadel. On Tuesday, prayers will be at the various PCC venues by 6pm. 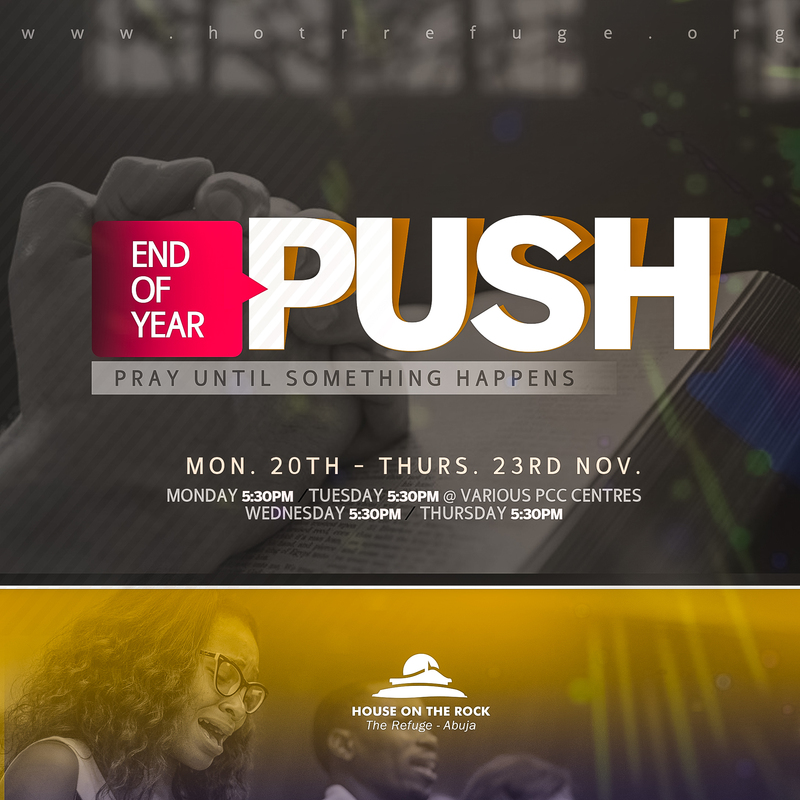 We will climax the period of the PUSH with a Special Word Alive Communion Service on Thursday by 5:30pm, at the Citadel! Get ready for effective prayers that avails much as we come to the end of the year. Healing School continues onThursday 23rd November 2017 by 4:40pm before the Special Word Alive Communion Service by 5:30pm at the Citadel. It promises to be another impactful time with the Word. Invite someone to be a part of it! Family Day 2017holds on Saturday, 25th November, 2017 by 11am at the Training Pitch near the Main Bowl Stadium, opposite Wonderland. There will be lots of activities for men, women, children, track and field competition amongst the 5 groups, lots of food to eat and plenty of fun. Parishioners are encouraged to come along with Water, drinks and fruits such as Banana, Apple and Peanuts to the event. The dress Code is Sporty Attire. Come with your entire family and friends, it will be fun filled family day!! For more enquiries, call Gladys on 08072583147. If you are a physical education instructor, games referee or a coach, kindly wait behind after the 2ndService, as your services will be needed at the Family Fun Day on Saturday or you can call Johnny Agim on 08023519097. The Experience Lagos will hold on Friday 1st December, 2017 at the Tafawa Balewa Square and on the 3rdof December in Abuja we will be hosting The Experience Over flow with the Legendary Psalmist – Don Moen. To promote these events, we have Experience Shirts and T – Shirts for those interested and can be worn to our Services on Thursday 23rd November & Sunday 29th November. If you have an old Experience shirt you can use it or otherwise kindly come to church in your regular attire. King’s Banquet – Christmas Edition presents – Operation Spread on Saturday 16th December 2017. It is an outreach to minister the gospel and Substance to members of our immediate community. For this we intend to give out 1000 bags of 10kg rice at N4000 each and 1000 gallons of oil at N900 each. Members are also encouraged to bring in kind donations of clean clothing items, non-perishable food items, and shoes and cash gifts. It’s time to show love to the less privileged! WEDDING THANKSGIVING!!! & Mrs. David Gadzama *Do not forget to invite someone to be a part of our Healing School and Word Alive Service on Thursday. ANNOUNCEMENT FOR SUNDAY SERVICE, 5TH NOVEMBER, 2017. Regular Pastoral Care Centre (PCC) meeting resumes this evening and on Tuesday 7thNovember at the various PCC venues across the city. ALL MEMBERS are encouraged to attend and those who are yet to identify with a PCC family should do so. A New Pastoral Care Centre (PCC)will be birth at 26 Osun Crescent, by BPE Maitama. Members living around this area should take note to attend! SHELTER STUDIOSis calling on members who are skilled in Creative and Performing arts and are interested in working with the team to kindly drop their contact details at the Information Desk after Service. All couples who do not have children yet, expectant couples and couples who want to have more children are invited to the Special New Life Fellowship Meetingthis evening by 5:30 pm at the Citadel. Ministering: Pastor (Dr.) Chinedu Nwosu. It promises to be an impactful meeting. Healing School continues on Thursday 9th November by 4:40pmat The Citadel. Everyone is invited to attend! Watch out for the next edition of Word Alive Interactive Service, on Thursday 9th November, by 5:30pm at The Citadel. Topic: “Help! My brother defrauded me! What do I do?”It promises to be an interesting edition. Don’t miss it! It will be an awesome time in our Double Impact Services on Sunday, 12th November, 7:45am & 9am at the Citadel. Come expectant and Invite someone to church!! Refuge Academy invites those interested in becoming bonafide members of this assembly to start the two-week New Parishioners Classon Sunday 12th November by 7am for Alpha Service attendees and 8am for Rainbow Service attendees. Venue – Meeting Room 5 on the 1st first floor of the Citadel. Members who have completed theNew Parishioners Class and have the desire to join the work force or simply want to dig deeper as soldiers in the Lord’s army, should please register for Finding the Rock and Spiritual Authority at the Refuge Academy Desk at the foyer. For further enquiries, please visit the Refuge Academy Desk at the foyer or on the 4th floor, meeting room 1 at the Citadel and Towers. There will be Water/ HolyGhost baptismon Saturday 18th November 2017 by 7:00 am prompt. Interested members should kindly register with the Refuge Academy at the foyer or the 4th floor of the Citadel building. We will dedicate babies on Sunday, 19th November, 2017. There will be a baby dedication class on Saturday 11th November by 10 amand it is COMPULSORY for both parents. Kindly note that the deadline for the submission of forms is Tuesday 7th November, 2017. A new season of King’s Banquetoutreach will hold on Saturday 9th December, 2017. Members are encouraged to bring in kind donations of clothing items, non-perishable food items, shoes and cash gifts. It’s time to show love to the less privileged! The theme for the month of November is “LOVE: THE GREATEST OF ALL”…… 1Cor 13:13 *****************************POSTING OF BANNS**************************** *Do not forget to invite someone to be a part of our Healing School and Worship Interactive Service on Thursday. 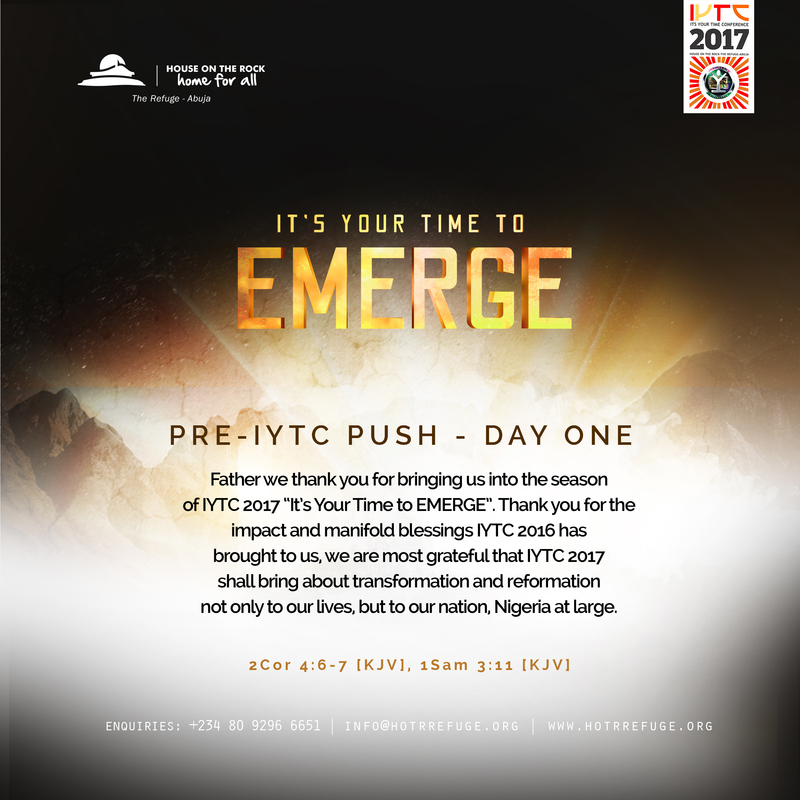 Our Pre-IYTC PUSH began 12 midnight today! 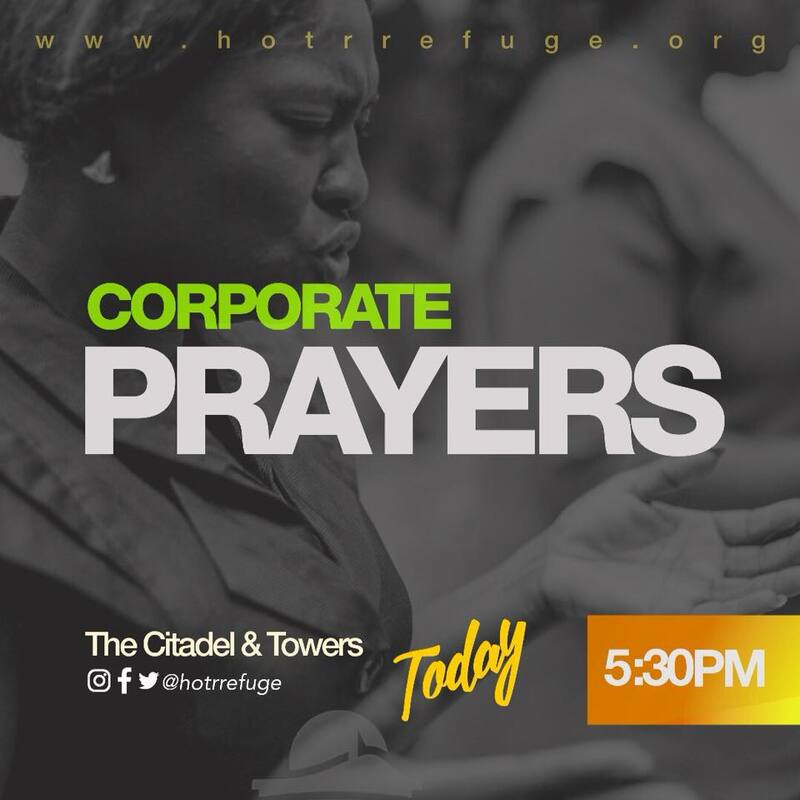 Join us this evening for corporate prayers by 4:40pm at the Citadel. It’s time to Emerge in the place of prayer!